Cats are agile creatures, they generally like to leap, climb and slink their way around the home and garden. Although they are great at negotiating objects it doesn’t hurt to give them a helping hand from time to time, after all houses are built with people in mind, not our fluffy companions. Does My Cat Need Steps or Stairs? There seem to be numerous things you can buy for your cat to improve the quality of his life, from costly food to interactive toys, a luxurious bed and a tower complete with scratch post and platforms enabling him to survey his kingdom. Give your pampered puss a “leg up” by investing in a set of cat steps or stairs. We know that cats love a good snooze and steps offer a safe and secure way for your cat to clamber up onto the sofa or a comfy bed (and enable him to get down again). You can get steps that are appropriate for indoors and those which have been made for outdoor use – you can help kitty to climb up and down a steep decked area or to take a seat on your bench, where he can view the birds going about their business. You might have noticed your cat is no longer as nimble as he once was, you can often spot a weary cat – he will choose lower level places to sleep (to save him having to jump up). If you find your pet is struggling you can rest assured that cat steps/stairs will help him to get about a little easier. A more mature cat may need a few aids to make his day easier (just like your elderly neighbour relies on his glasses and cane to get about). If you feel your car would benefit from using cat stairs / steps there are certain features you should look out for. Check out the height of the steps, as a guideline “normal” stairs are around 7” high. Steps that are too narrow can be tricky for cats so look at the depth of the stairs too. Ideally a depth of around 11” is perfect for your pampered puss. 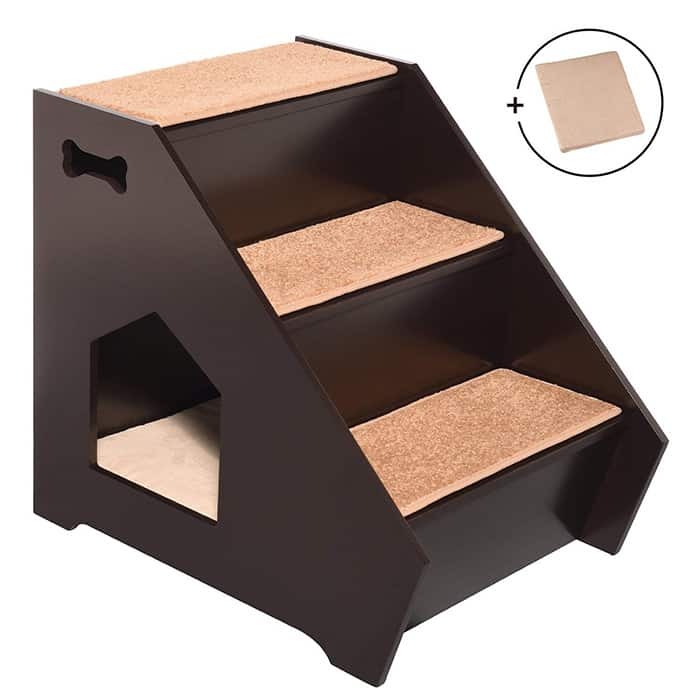 The best pet supplies foam pet stairs / steps come in a variety of colors and sizes (chose from the 3-step, 4 -step or 5-step design), so you can select the steps that best suit your home and cat! 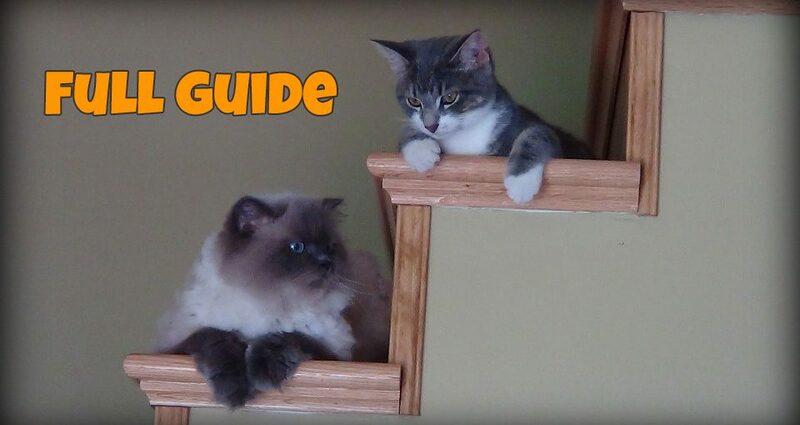 We love that these steps are so soft – which enables your kitty to grip more easily (preventing slips and falls). 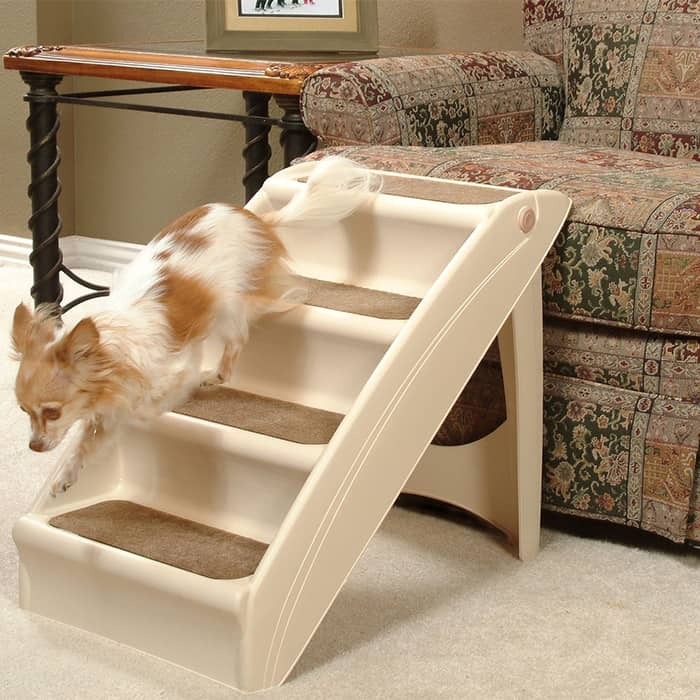 The steps are designed to be non-slip and are each stair is nice and wide, giving your pet plenty of room to manoeuvre. The Arf Pets Cat Step House are perfect as an aid to help puss reach the bed or sofa. The steps are wooden and comprise of a 3-step platform. 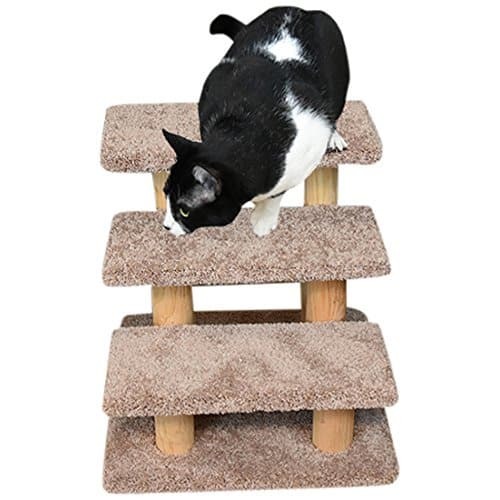 The steps are non-slip and are nice and wide, they are covered in a soft, yet robust carpet that is comfy for your cat and provides additional grip. These steps also have the added bonus of having a little “hidey-hole” where puss can go for a spot of quiet time. 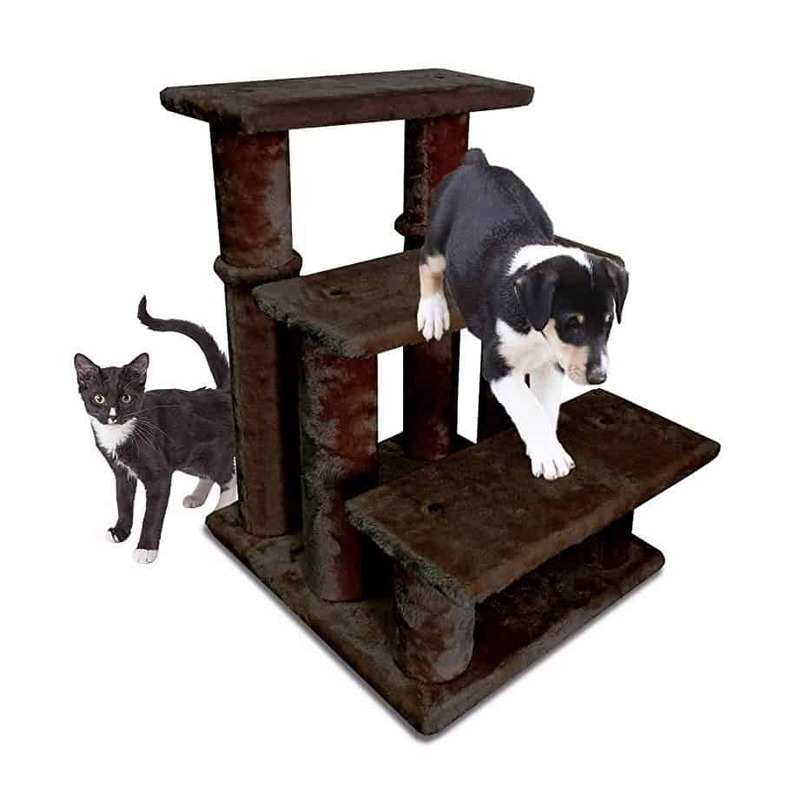 These steps are built to last and can safely support cats that weigh up to 150 pounds. We also like the fact that thought has been given to how they are to be moved around the house and come with integrated handles so you can carry it around more easily. The New Cat Condos Large Pet Stairs are great for your kitty (especially if he is on the portly side)! They are robust and sturdy and made from solid wood. 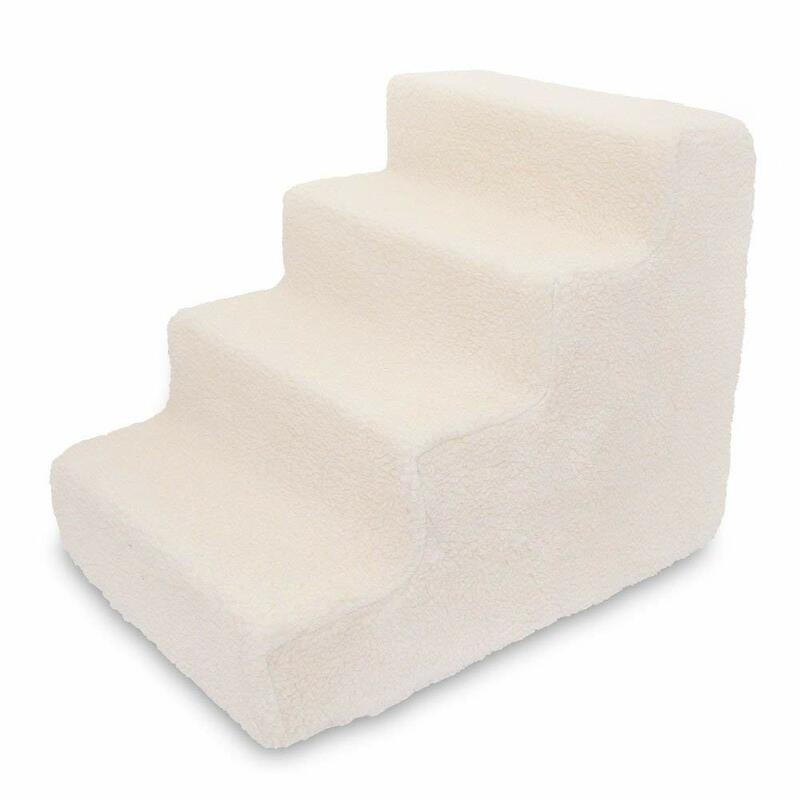 The steps are covered with carpet to make them more comfortable and provide grip for your feline friend. The Solvit PupSTEP Plus Stairs are designed to complement the modern home. They are very light (so can be moved around from room to room depending on where you want to use them) but are still able to accommodate a cat weighing up to 120 pounds. We like the fact that there’s no fiddly assembly needed to set up these steps and if you’re short of space you can fold them and store them until needed. The Solvit steps were designed with safety in mind – there are ant-skid feet and safety rails too! The FurHaven Easy Step Pet Stairs are particularly good for small cats and those that are enjoying their twilight years. They are designed to be soft and comfortable – easy on the paws and come in a 3-step or 4-step design. We like that these steps can be vacuumed or wiped over if they get a bit grubby. Whichever cat steps / stairs you choose make sure they fit the needs of your fluffy friend. Steps might seem a bit cumbersome and you might not want to have them dotted around your home, try and find a set that complement your décor and that are inobtrusive. Steps that can be stowed are useful, but if your cat likes to move around regularly you will probably want them out so he can use them whenever he wants to!